choir croak out them goodies: Free and shameless label promotion. Also, a sift through MySpace. Free and shameless label promotion. Also, a sift through MySpace. It's time for another annual update on Damaged Goods! 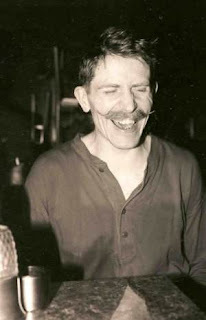 This season brings new word on Billy Childish, in particular and most notably, as he and his Musicians of the British Empire will be releasing their third record together, Thatcher's Children, on July 28. The label will be releasing the title track as single one week prior to the album. This week, alternately, sees the It Came Out of the Wilderness EP by marvelous folk singer Pete Molinari; the release is a limited edition of 1000 7-inch records, and contains two previously-released tracks as well as one brand new acoustic number. Stream the whole thing on his website (enter and click "Music"), then buy the EP here. Unrelated to the Damaged Goods label, The Supreme Genius of King Khan and the Shrines is streaming in full on MySpace. Very much related to MySpace, however, it came time for a new session of poking and prodding around, and sure enough, I ran across a few interesting bits and pieces of music. House That Jack Built (Liverpool) - Unsigned, "indie" in the generic sense of the word, but pleasant pop with nice vocals. A Broken Robot (Liverpool) - Unsigned, basically a poor man's Wombats (and yes, I'm sure the Wombats are a poor man's somethingorother). It's sweet, though, that they claim "We will play anywhere/anytime for nothing more than a few petrol pennies." Thin Man (San Diego) - Wonderfully generic, mindless garage rock. Fun! Party!!1! Victor Deme (Burkina Faso - West Africa) - Perhaps my favorite of this bunch; apparently the guy's finally released a record after thirty years of making music. Really lovely folk sung in French. Hugh Coltman (Hackney/Paris/London) - A folk singer with an elegant voice that's soft in a Chet Baker-sort-of-way. Except this isn't jazz. And he doesn't look much like a user. Apparently the former vocalist of the Hoax? Hell if I know. Toby Dammit (Berlin/Tennessee) - A man with one hell of a musical history who really ought to collaborate with the Real Tuesday Weld. I also learned that Vanessa Hudgens has more MySpace friends than Miley Cyrus by approximately 200,000, but that on her big tour this year, she's already playing a number of state and county fairs. How is this reasonable?